As parking continues to cause headaches for millions of drivers, parking assist systems are becoming increasingly important. 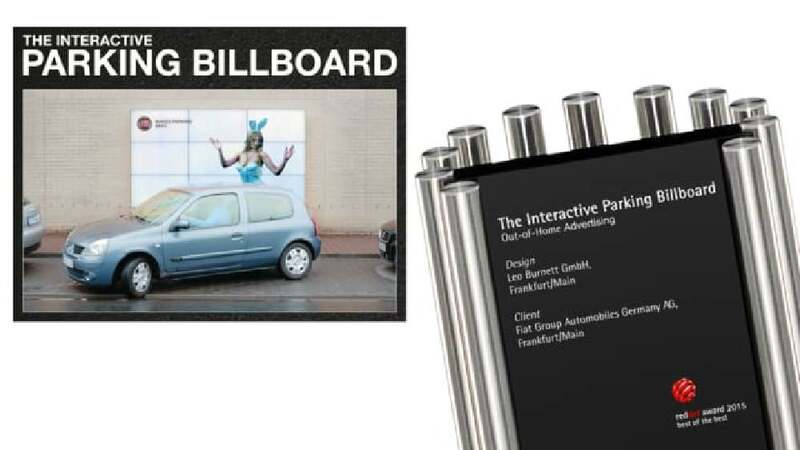 Aiming to further turn the bothersome parking process into an enjoyable experience, and thus giving a not entirely novel subject new energy in a completely different way, Fiat introduced the interactive parking billboard as the first video billboard to help drivers with parking. On the streets of a major German city it was demonstrated live just how easy parking can be with this system. Dedicated software was developed that uses ultrasonic sensors to control the parking assist system on the billboard. The individual video sequences were played back following a script so that the distance between the hands precisely matched the distance to the car behind. Different models directed the parking process with skilful drama and applauded after the driver had manoeuvred the car successfully into the parking space, spreading a good mood. Overall, this made parking more stress-free and safe. The idea and realisation of the interactive parking billboard is a wonderful example of an interactive campaign showing the distances between your car and the ones in front and behind. The way the people on the board measure it and communicate it to the driver is cute and funny. Thus, the board is of great help in daily traffic; it makes parking more secure and turns it into real child’s play.